very nice quality, true to description, very elegant. Comes with light bulbs. Not compatible with sloped ceiling. 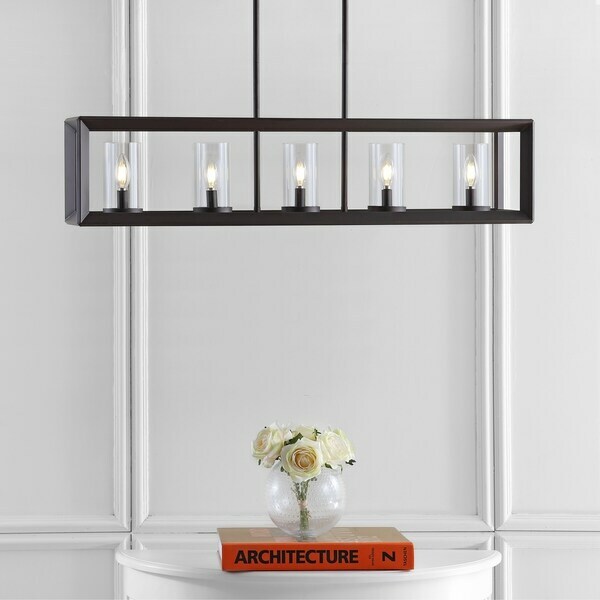 A classic hanging lantern pendant is made modern by the geometric angles of the caging on this decorative piece. Perfect for a dining table or kitchen island, you can adjust the drop according to your desired height -- from a minimum of 28" to a maximum of 100" inches. And if regularly getting on a ladder to change bulbs isn't your thing -- this fixture is compliant with LED bulbs which can go years between replacements. Dimensions 8.25 In. X 38.5 In. X 39.0 In. I love this light fixture. It goes perfectly in my dining room. My brother installed and he said it was a bit difficult to install, there was no way to hang it while putting in the fasteners - we had to hold it up there for him. But in my opinion worth the effort! The LED bulbs that came with it didn’t dim very well (yes, I used the proper Lytton switch) so I changed them out for incandescent bulbs and they work perfectly. It’s mostly off, we hardly use the room, so I’m not too worried about energy consumption with regular bulbs. It looks great, and overall I am very happy with my purchase! 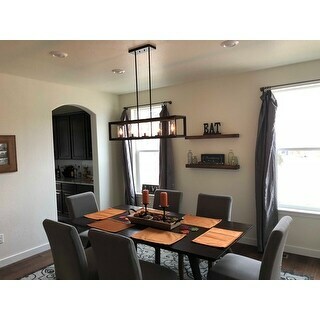 This light fixture is for my dining area in my brand new construction home and I could not be happier of my choice. Love, Love it! Perfect choice! The look & stylish design made my home. Thank you! Product looks beautiful in our dining room, great size to hang over our 8 person table. Delivery and Installation was great! "I love the light fixture and I love the bulbs It came with. I just don’t know if it’s warm white, Amber or what. I bought the matching pendants also, but the pendants didn’t come with lightbulbs. What exact light bulbs did the light fixture come with? I need to buy to match my pendants. Thank you"